More or less a usual day. Kids ran their usual distance. Benjamin did 10.64 total. We did a pickup for 1.5 miles in 8:07, splits 2:44, 2:43, 2:40. My back felt better, and I felt more motivated to run. Benjamin said he felt the pace was hard. Today Benjamin did an 8 mile tempo run from a little above the Vivian Park to our house in 44:26. I tried to run with him, but after about 0.7 my back complained enough, so I eased off to about 5:50 pace and coasted to about 3.5, then drove and rejoined Benjamin for another 0.7 around his 6 mile mark, then drove again, gave Benjamin some water, and drove home, then ran with Joseph and Jacob. Benjamin ran into some issues with dehydration today, got a side ache, and generally was not feeling energetic. This was not unexpected - he had some volume and intensity increase over the last couple of weeks. We need to figure out how to improve his recovery. Maybe we just need to be patient - drop the volume some, and wait for his body to tell us when it is ready. On the plus side he did handle the issues better than in the past. When he crashed, the pace slowed down to 5:42 average over the last 2 miles which are on a difficult terrain and tend to be slow. Ran with Benjamin to where I parked. Today Joseph, Jacob, and Stephen did a 400 meter time trial on the track. Joseph got 71.9, Jacob 72.7, Stephen 1:40.1. All three ran new PRs. I did not run the 400 with Joseph and Jacob due to back pain. Benjamin was at the missionary preparation camp, ran 8 miles there with his friend Logan. Warm-up with Joseph, Jacob, and Stephen, and Matthew and Mary in the stroller. Joseph and Jacob's 400 - I just jogged to give them their split at 200 and back. Mary tried to run 100 but she was barefoot, and her feet started hurting from the track, so I picked her half or so way through. Jacob suffered from being overheated in the last 300, could not move. William was having issues as well, some physical, some mental I think. Stephen's were mostly mental, which I think is typical for a 5 year old. Benjamin looked strong, but very awkward. He felt like he could not push. The first 300 was good - he had some competition. After that the competition dropped back, and as soon as they did he downshifted from 64 pace to 72 and stayed there until it was time to kick. Towards the end Colby Hamson closed some of the gap, but not enough to make contact and motivate Benjamin to kick harder. In the evening, Benjamin, Joseph, Jacob, and I ran some extra distance. Benjamin did a 2 mile tempo run down the canyon in 10:10, splits 5:07, 5:03. After that he was overheated, but felt somewhat better when he changed his shirt to a lighter one. To the house from Canyon View Park. Pickup with Joseph and Jacob when Benjamin caught up to us. Back to Canyon View Park with Benjamin to get the car. 10 total. All with Benjamin. Usual distances for the kids. Benjamin and I did a pickup for 1 mile in 5:47. We went to the canyon today. Benjamin did 2 miles down in 9:48 (4:52, 4:56) - something was wrong, he was tense. William did 0.5 in 3:08.8 down the canyon. Joseph ran 1 mile in 5:31.4, Jacob got 5:40.6. Jacob had some issues as well - he felt tension from the start. Benjamin did total of 8. Otherwise usual distances for the kids. Williams 0.5 down the canyon. Paced Joseph and Jacob through a mile down the canyon. With Matthew - new record. With Julia for the first 1.5, then did a pickup for a mile, she ran for the first 1 minute with me. Cool-down, ran back to meet Julia, then ran with her. Today Benjamin ran into a serious issue. He ran one mile with Joseph, Jacob, and William in 8:07, and everything seemed to be fine. Then he ran another mile with William in 8:17 and during that mile started feeling pain in the tendon under the knee. He tried running more, but could not go for even a mile, and ended up walking home. I ran a total of 10. Usual distances for younger kids. Another miserable day for Benjamin. He could only run 1 mile. Took him to Josse, she massaged and scraped him. That was painful enough to make him recite Russian poetry which provided some entertaining value for Josse's kids. I did a total of 9. Joseph and Jacob and William did 2, Stephen 1, Jenny 4, I think. Julia had a stomach problem, and was only able to run 1 mile. With Stephen, Joseph, Jacob, and William. Alone, did a pickup for 1 K down the canyon. Taper day before the UVM. Benjamin was able to do a bit better than the day before - ran 3 miles on grass. Kids ran less in the AM due to the state track meet (USATF). I did a quarter pickup at the end of the run in 81.8 on the road. In the state meet Jenny and Joseph ran in the 3000. The conditions were horrible - 92 F, 5 pm, so the sunlight is still quite direct. I thought of a few things to mitigate the impact of the heat. First, I had them drink an ice smoothie 30 minutes before the race to keep the body cold. Second, I had them cut down the warm-up to just a 100 meter jog from the van to the start of the race 5 minutes before the start. Until then they sat in the van with AC on. That seemed to work, they ran fairly close to their recent PRs in spite of the conditions and performed better relative to their competition. Joseph ran 11:23.62, 11 seconds off time-trial PR, 3 seconds off race PR. Splits 3:39, 3:47, 3:57 - last K was rough, but it was rougher for his competition. Jenny - 12:28.25, splits 3:55, 4:16, 4:17 - same deal with the last 1 K.
Ran in the Utah Valley Half today. 1:17:45, 12th overall, 1st master, $150. Lost about 25 seconds in the bathroom. Brett Hales won with 1:05:45. Benjamin was injured and not able to race. We did a lot of work to help the injured muscles heal, but the problem ended up bigger than what we had the ability to fix in such a short amount of time. He was able to jog 4 miles, some on grass, but was not anywhere near racing. Just to check if maybe the miracle had happened I had him do a 200 meter stride in front of our house. His first 100 was 20, then he slowed down to 23 due to uncooperating muscles. This was a sign to us that he should not start the race. My race was rather strange. I felt quite decent up to 8 miles averaging a bit slower than 5:40 and feeling that I should be able to finish at 5:50 pace or so. Then I lost contact with Kyle Petersen, had a bathroom stop, and then for the life of me could not even run 6:00 pace. Not sure what happened - I was not feeling bad. Maybe I had not done enough long tempos and just do not have endurance past 8 miles. Maybe this is part of getting old - when I had somebody with me I could run, but when I was left alone I just could not find my normal toughness. I am going to be more thorough to make sure long tempos happen. I am also realizing that I need to do 2 hard workouts a week with good rest in between. I have been doing more frequent light speed. Will see if that makes a difference. Post-race was quite eventful. At the awards ceremony I was surprised to meet our blogger Mark Palamer who came here to run the marathon all the way from Florida. I invited him to join us for the rest of the day. First we went to the USATF Utah championship. Jacob ran 800 in 2:38.79, perfect splits of 78,80. He got outkicked by McKay Wells on the home stretch, but it did help McKay run a PR of 2:35.88. This was the best track 800 that Jacob has run in competition. I was happy to see that he was finally able to pace himself properly in a competitive situation. William ran 3:14.27 uncontested after the first 100 meters. Stephen played a goof ball today and ran 4:22. Then we went to the OremFest "mile". It was a bit shorter, maybe only 1500, if that. The race offered small cash prizes for the kids going three deep. I was not sure if they did it by grade, so I signed up only Joseph, Jacob, and William hoping for the top three sweep. It turned out later they did it by grade, so we ended up with three wins. In retrospect I should have signed up Stephen as well. Next year if they have it in the same format, I will have Joseph, Jacob, William, Stephen, and Matthew. Joseph got 5:16, Jacob 5:21, William did not time himself. Matthew and Stephen ended up running about 1.5 miles for transportation purposes. Mark ended up doing some post-marathon running as well. Afterwards, we all had dinner at our house. Splits were 5:29,5:34,6:12(uphill). Started out with Mike McPherson and Richard Harris and ran with them for 2 miles, then felt the pace was too fast. Towards the end of this mile Kyle Petersen caught up to me, and I followed him to 8 miles. Also happy with this one. This was my last good mile. Lost contact with Kyle, and started to feel the urge to go to the bathroom. Lost about 25 seconds on the bathroom stop. Tried to shift gears, not much happening. I think this stretch was long. Stephen was disappointed that his older brothers got cash, but he did not. So I told him I would give him $5 if he ran 3:45 in the 800 time trial, and $1 for each second under that. I knew that with the 400 PR of 1:40 he could have really milked the system, but I was OK with that. In the end I could never get him to go the right pace. Benjamin ran 4 miles on grass. I joined him with Joseph, Jacob, and William for part of it. Younger kids ran their usual distances today. Then I added another 5 miles, to make the total of about 9. Today I ran 5 with Jenny, then took Joseph, Jacob, William, Stephen, and Matthew to the track. Joseph and Jacob did 4x200 with 200 recovery. The purpose of the workout was for Jacob to learn how to feel what a 37 200 feels like. I feel this is going to be critical to his ability to qualify for the final in the 800 in the Junior Olympics Nationals. He will likely need to run 2:32. He has a shot if he paces it with Frank Shorter style precision running the splits of 37,38,39,38. Now when you are 10 years old and you are racing boys that open in 72 seconds or faster and then half of them or so fade and become a roadblock, this will be a quite challenge. So my thinking is that if he learns what 37 feels like very very well he might be able to pace himself right in a competitive situation. So I told Joseph to purposefully try to mess Jacob's pacing up by running either too fast or too slow while I just jogged the diagonal to record the split. Jacob got 37.8, 40.3, 36.3, 37.8. Then I had William do the same workout practicing 45.0 for 200 pace. William was more consistent - 45.6, 44.7, 44.8, 44.4. I did not pace him in it either again just doing diagonals, and jogging the recovery with him. Then I added some distance on the track, and ran 2 miles with Benjamin in the evening. Benjamin did 6+2, starting to feel more normal, but still with enough residual pain that he cannot run full mileage and speed. More distance around the track. With Benjamin in the evening. Put Benjamin in charge of little kids runs today. They did their usual distances. Did a workout in the Provo Canyon. Ran the warm-up with Jenny (she did 5 total), then did 2x1 up (5:48,5:51), 3 down in 17:13 (5:48, 5:45, 5:40), and 1 up in 5:53 - all with 0.5 recovery jog. Benjamin did 8 in the AM, some on grass, then 2 in the PM with some striding on the track - 2x100 in 18 seconds, 200 in 35, and 400 in 72. Was able to do it, which is a major improvement from Saturday morning, but still said it felt much harder than that pace should due to the stride abnormalities. Ran with Jenny, then with everybody else except Julia. Total of 12+. Benjamin did 8 + 2. Stephen did 1.7. Otherwise usual distances. 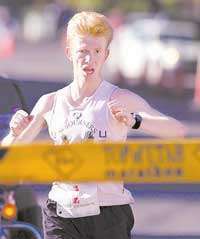 Talked to Josh McAdams at the park - he was visiting Utah to run in the Rangar Relay. To the park with Benjamin, Joseph, Jacob, William, and Stephen. With everybody except William and Stephen. Today William ran 0.5 down the canyon in 3:03.7 - new record, splits 90, 93. Joseph and Jacob did 1 mile. Joseph 5:28.6 (82,84,83,79), Jacob 5:35.2 (82,84,84,85) - new down the canyon records for both. Benjamin was having issues with his hip in the morning, ran only 6, but then felt better in the evening and did 2 more volunteering 7:00 pace. I paced William, then Joseph and Jacob. Then took the car to the car shop to get a few things checked out/fixed before the trip to Bozeman, and ran back the long way to get the distance for the day. Warm-up with Joseph, Jacob, Benjamin, and William. William 0.5 down the canyon - new record. Everybody helped pace. Recovery with Joseph and Jacob. Benjamin took William home. 1 mile down the canyon with Joseph and Jacob. Long way from the car shop. Started with a 16 mile run - 8 from the house to the magic spot near the Vivian Park, and 8 back as a tempo run in 47:03. The tempo run was hard, but I was able to hold a steady pace. Some important stretches - 3 miles from Nunn's to the mouth of the canyon - 17:28, last 2 miles - 12:03, last uphill mile 6:08. This was my first long tempo this year not counting the half marathon and the 15 K races, and the first one period done in the middle of a long run. Never hit any fuel issues, but I did feel that the heart did not want to pump long and hard. Then we went to the Run for the Refugees 5 K. This was more to support the idea of this unique type of fundraiser than to actually race. What is unique about it is that the race cost (if you do not want the shirt) is covered by the vendors that are selling the merchandise or getting exposure otherwise in compensation. You optionally can donate. That works out quite well since your budget has not been hit by the entry fees, and you know that all of it is going directly to the cause without the overhead of covering the race. The course was a loop in the Indian Hills area of Provo, and involved a lot of steep hills, both up and down. It ended up being short, about 3.01 according to my map, but the hills made it worth about 3.20 according the Course Tool. I ran with Joseph and Jacob to make sure they did not beat their legs up too bad and had them hold back on the steep downhill sections. Benjamin ran with William. He asked me at the start if he could race it, but I told him absolutely no on that course given his current fragile state, but it was a good sign that he felt good enough to ask. Joseph ran 21:04, I ran 21:09 with Jacob, William got 23:30, Sarah ran the flat, downhill, and moderate uphill, and walked the steep uphill in 31:59 (32:22 from the gun, with the crowd it took her a while to make it to the start). This was a confidence builder for her, as she is not good with hills even when not pregnant, and she is 24 weeks pregnant now. Then the kids ran the 1 K. Initially the plan was to have Joseph run hard although not too hard, have William and Jacob pace Stephen, and have me pace Matthew. But Stephen was playing a bum, at one point and for quite a while he was behind Matthew. So I told William and Jacob to just go for it. Joseph got 3:43 (1st), Jacob 3:57 (3rd), William was around 4:30 (4th), Stephen 5:26, Matthew 5:34. Tempo run from the magic mark near Vivian Park to the house. Made easier by Hawk Harper's new triangle marks on the trail. To the start of the race. Run for the Refugees. Ran with Joseph and Jacob, then ran back to meet Benjamin and William, to the finish with them, then back to check on Sarah, and some more distance. Paced Matthew through the 1 K.